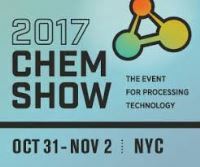 The ChemShow, is where process engineers, production/plant personnel and executives from companies across the Chemical Process Industries (CPI) come to see the latest technology for their process operations. HEINKEL Drying and Separation Group invites you to visit our booth! Our technology experts will tell you about our innovative and dependable solutions in filtration and centrifugal technology, nutsche and vacuum drying and mixing from our well-respected brands BOLZ-SUMMIX, COMBER and HEINKEL. The exhibition will taking place from 31st of October to 2nd of November in New York City. We are looking forward to your visit at our booth #104.